Ryley Outdoors: Rain, rain go away! Rain. That’s what it has been doing every day for the past two weeks. Rain. It makes for horrible camping. It makes for horrible fishing. It makes a horrible mess. But, we don’t let that stop us. As Scouts and Scouters we learn to be prepared. We learn to endure. As our boys so proudly proclaim “If it’s rainin’ we’re trainin’, if it’s snowin’ we’re goin’!” With that in mind I headed down to Nanjemoy, MD this past weekend for one part training, one part fishing and one part brotherhood. Lions Camp Merrick was the site for my BSA Certified Angling Instructor course and is located on the banks of the Potomac River. During the summer the Lions Club runs the camp for children with special needs. We were allowed to use the camp this weekend because the local Boy Scout District, Zekiah, was hosting their annual Ordeal weekend for the Order of the Arrow (OA). The OA is the National Honor Society for Boy Scouts. Jacob with a nice blue catfish. 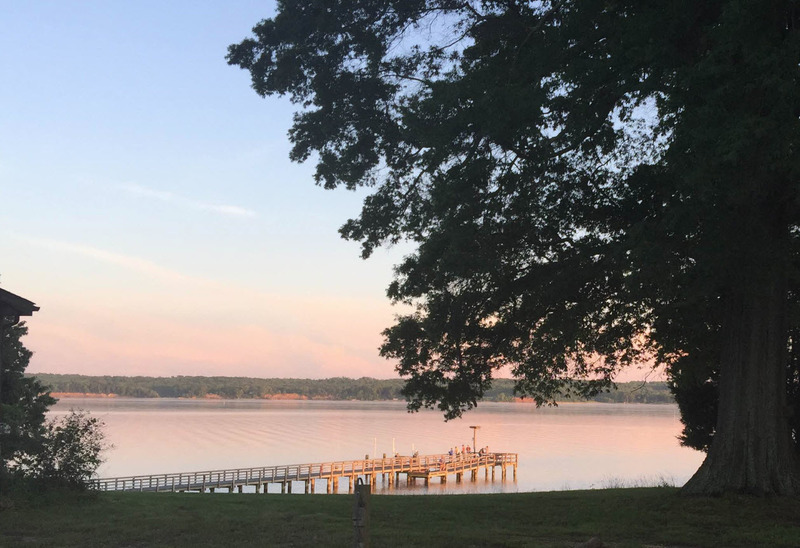 The camp features a fishing pier as well as “beach” access to the Potomac. Upon arrival the river was the color of chocolate milk from all the recent rains. After getting unpacked and settled in I headed down to the pier to see if any of the scouts were having success. For most of the evening the caught white perch but just after 9:00 one scout, Jacob, was able to hook into a pretty decent size blue catfish. I stayed up nearly half the night, after everyone else went to bed, continuing to catch and release the white perch. My San Juan Worm. Now I just needed a bottle of tequila. The next morning we were up early to start our instruction. Throughout the day we attended classroom trainings, received hands on instruction on how to fly-fish and even how to tie flies. I even managed to fit in a walk/jog, in my new Altra Instinct 3.5, along the river where I scored some sea glass! I didn’t do too badly on tying my San Juan Worm either but I struggled with my casting. Before the night was over though the rain struck again. But just as quickly as the rain and wind had come, they left taking the warm temperatures with them. Just a small fraction of the sea glass I collected. That meant only one thing, time to go fishing. Unlike the previous evening the white perch hadn’t decided to show up just yet. So we all cast out our lines with either cut bait or earth worms. As luck would have it I nailed a nice blue catfish on the cut bait and about an hour later pulled in a tiny bluecat on an earth worm. That’s when everything went downhill. I attempted to de-hook the small catfish with my bare hands. That turned out to be a painful lesson for me to learn as the small pectoral fins from the catfish sunk themselves into the side of my hand.